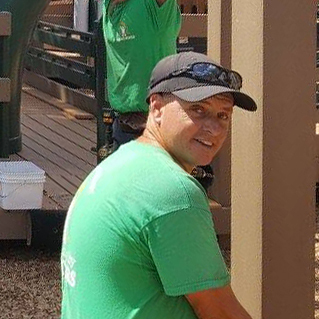 Aaron (and his wife) were instrumental in organizing and building a L&A playground in his hometown of Jensen Beach and it was then that we knew he just had to be part of our team! Since that time, he has joined our office staff and traveled all over the United States managing and building awesome playgrounds. His project management, building, architectural and business background come in handy as he organizes and leads groups of volunteers. Whether on a contractor or volunteer build, Aaron is very level headed in all situations, has a positive attitude and upbeat approach. Aaron’s role here in the office extends beyond supervising playground builds, he is also a proficient Project Manager. His extensive building and project management experience proves helpful when staying connected with past projects and assisting communities with plans for playground renovations, retrofits and replacements. In addition to his broad community-build experience, he has also led and organized numerous contractor installs. Volunteerism is not new to Aaron as he is a Florida Certified Firefighter/EMT. Prior to joining L&A’s staff he owned and operated his own construction company for more than 10 years. With four kids of his own, he understands the importance of creative, safe playgrounds!